Ever since it was first released back in 2001, Pikmin is a franchise that came out of nowhere and was a pretty big hit for Nintendo. Being a fan of both real-time strategy games and puzzle games, I really enjoyed Pikmin. Pikmin eventually received two official sequels and a spinoff game. Outside of the spinoff game though, there hasn’t been a Pikmin game released since 2013. While there are some indie games that have utilized a similar premise, I am kind of surprised that there haven’t been more indie Pikmin-style games. This is why I was intrigued by Terrorarium as it is clear that the game took inspiration from Pikmin. 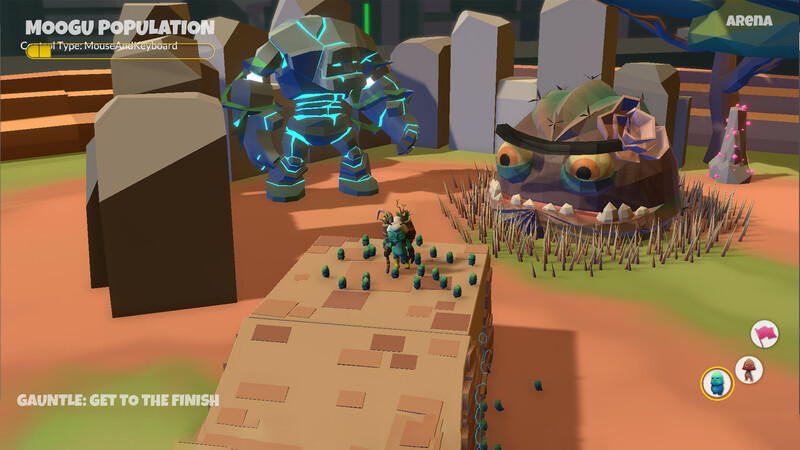 At this stage Terrorarium is a little rough around the edges but it has the framework needed to be a good indie version of Pikmin. We at Geeky Hobbies would like to thank Stitch Media for the preview copy of Terrorarium used for this preview. Other than receiving a free copy of the game to preview, we at Geeky Hobbies received no other compensation for this preview. Receiving the preview copy for free had no impact on the content of this preview. While the two games are not exactly the same, it is hard not to deny the similarities between Terrorarium and Pikmin. In Terrorarium you play as “The Gardener” who controls a group of small creatures. The creatures in Terrorarium are called Moogu and they somewhat look like Pikmin. Your goal in the game is to use your Moogu to remove the obstacles blocking your path to the finish line. Anyone who has played Pikmin or another similar game before should already have a pretty good idea of what it is like to play Terrorarium. I would say the one area where Terrorarium differs from Pikmin is that it seems to focus more on the puzzle solving aspects of the game instead of combat. At least in this stage of development combat doesn’t seem to play a big role in the game. Instead the game seems to focus more on avoiding hazards as you use your Moogu to clear obstacles. This requires some puzzle solving as you need to reach the end of the level with enough Moogu in order to open up the exit. Most of the puzzle elements in the game come from the fact that all of the Moogu has different special abilities. Each Moogu has different strengths and weaknesses which you need to take advantage of in order to advance in the level. For example one Moogu is so hot that it can resist flames and can even set plants on fire removing them from your way. Another Moogu is really heavy which weighs down platforms and makes them better at destroying objects. One group of Moogu can even be used to launch you over obstacles. Unlike Pikmin, the Moogu can be switched between the different types at any time. With the press of one button you can change all of your Moogu into a different type. While I like how easy it is to change your Moogu, I wish the game would let you control Moogu of different types at the same time. This could add quite a bit to the game in my opinion. Outside of the emphasis on puzzle solving over combat, the next biggest difference between Terrorarium and Pikmin is how you manage your creatures. In Pikmin you mostly just bring back objects to your ship which gives you more Pikmin. Terrorarium handles things a little differently. In order to get more Moogu you need to move your Moogu over the corpses of fallen Moogu. This allows them to multiply. You may encounter Moogu corpses on the battlefield or you can use your own Moogu that are killed by obstacles or creatures. This is an interesting twist as you sometimes have to strategically kill some of your Moogu in order to grow your ranks. You can’t run out of Moogu though so you have to be shrewd in deciding when you sacrifice Moogu. This is especially true as there is an upper limit on how many Moogu you can have. If you ever have more than 100 Moogu at any time, you automatically fail the level. Because of this there is quite a bit of management as you don’t want to have too few or too many Moogu at any given time. I think the idea of how you have to manage your forces is interesting but it is a little rough at this point in development. It is hard to have a lot of control over when more Moogu are created. You can walk over the corpses to try and spur growth but it doesn’t always work as well as you would like. This is partially due to the fact that it is not as easy to control the Moogu as I would have liked. You basically have one button that calls the Moogu to you and another that has them maintain their position. Otherwise the Moogu somewhat follow you which has mixed results. I think the game could have benefited from allowing players some direct control over their Moogu like in Pikmin. This would have improved the controls in addition to adding more gameplay options. It would also have also made it much easier to control the growth of your Moogu. There were times when I was running low on Moogu and was trying to get them to multiply. Despite being directly over the corpses, they refused to multiply. Other times they would multiply out of control where I couldn’t get rid of them quick enough to avoid failing the level. As Terrorarium is an early access game, it is understandable that all of the content is not currently in the game. At this point the game has no story/campaign. There are some pre-made levels but they are quite short and basically act like tutorials. It feels like these levels were designed in order to teach the basic game mechanics to players. Therefore these levels are pretty short and are not particularly challenging. Based on just the included levels, there is not a lot to do in Terrorarium at this time. It seems like most of the developer’s time so far has been spent on creating the level creator. At this point it seems like most of the level creator’s features are already in place. I didn’t spend a lot of time with the level creator but it reminded me a lot of using a game engine like Unity or another visual editor. You begin by choosing a pre-made stage layout. You can then choose objects, hazards, creatures, etc. that you would like to place in your level. The objects can then be rotated, scaled, or altered and placed wherever you prefer in the level. The editor requires no programming knowledge as it mostly involves dragging and dropping items into the level. After you have created your level you have the ability to share it with your friends or play it yourself. At this time it appears like you have to specifically share a level with a friend as there is no option for you to just play other players’ levels. I hope some time in the future the game gives you the opportunity to play other players’ levels without having to find friends to share levels with. The game could really benefit from having a system where you can browse other players’ levels and rate them. I am really curious how this aspect of the game will turn out. I personally am not a big fan of making levels and then sharing them with friends. I would be really interested in trying out other player’s levels though. The tools are pretty robust at this point where I think players could come up with some really creative levels. This is all going to depend on what kind of following the game develops though. I could see the game developing a real community where some really clever levels are created. If the game doesn’t grow a fanbase though, there is a chance this aspect of the game will be disappointing. As the game doesn’t include many levels created by the designers, the amount of time you can get out of Terrorarium right now depends on how many friends you have to share levels with. If you have a lot of friends to share levels with or just like making your own levels, I could see you getting a decent amount of time out of Terrorarium. If you aren’t big into creating your own levels or sharing levels with friends, the content is a little thin at this point. The developers are planning on adding a story mode at some point so there will be more content in the future. The experience today will be a little limited though. On top of not having a lot of content at this point, there are some glitches/bugs that I encountered. In addition to not having great control over the Moogu, there are a couple other control issues that come up from time to time. I also encountered a few bugs that crashed the game. The biggest bug I encountered with the game had to do with the framerate though. I am going to preface this by saying my computer is above the minimum requirements but is not a powerful computer anymore. My computer also tends to not handle early access games all that well. I would say that most of the time the game runs at around 40 frames per second on the lowest settings. Every so often the game would drop to the single digits where the game was basically unplayable. I would then have to wait until the framerate went back up before I could continue playing the game. I did play a pre-release version of the game so this may change when the game goes up for sale or could be fixed quickly with a patch. Also if you have a more powerful PC you probably won’t even encounter this problem. I just wanted to point this out as you might encounter some issues if your PC is close to the minimum requirements. Terrorarium is basically what you would expect out of a game just released on early access that is likely to be in development for six months to a year. On the surface the game is really intriguing. The premise is good and the foundation is pretty good. How the game combines the Pikmin style gameplay with puzzle mechanics shows a lot of potential. With the right amount of work I think the game could be really good. At this point though the game needs some work. The game doesn’t have a lot of levels at this point and they basically just serve as a tutorial. Most of the gameplay comes from the levels you and other players create. If you aren’t big into making and sharing levels, there isn’t a lot of content in the game right now. The game could also improve the controls a little and there are some bugs/glitches that need fixing. My recommendation for Terrorarium comes down to a few factors. First if you don’t really care for Pikmin style games, Terrorarium is not going to be for you. If you are not big into making and sharing levels, I would maybe wait a while until more content is added to the game. If you really like the premise though and like making and sharing levels, I think you should look into picking up Terrorarium as you should have fun with the game. Terrorarium releases on early access tomorrow, March 20th, 2019, on Steam. Has a lot of potential to be a good indie game inspired by Pikmin. There is a solid foundation that can be built upon. Doesn't have a lot of content at this point unless you like to make and share levels. Has some bugs/glitches and could use some fine tuning.